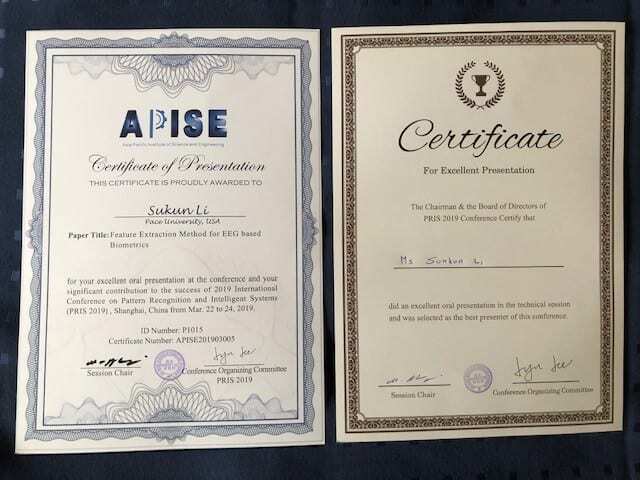 Pace University PhD in Computer Science candidate Sukun “Luna” Li was awarded “Best Presenter” at the 2019 International Conference on Pattern Recognition and Intelligent Systems, which took place March 22-24 in Shanghai, China. 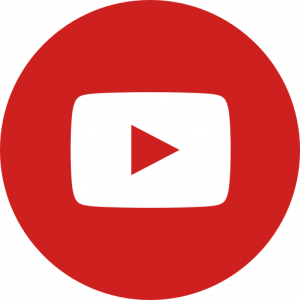 This conference discussed artificial intelligence, pattern recognition, and deep learning. Comprised of two sections – oral presentations and a poster session – the conference brings experts from around the world to present their research and share their discoveries. 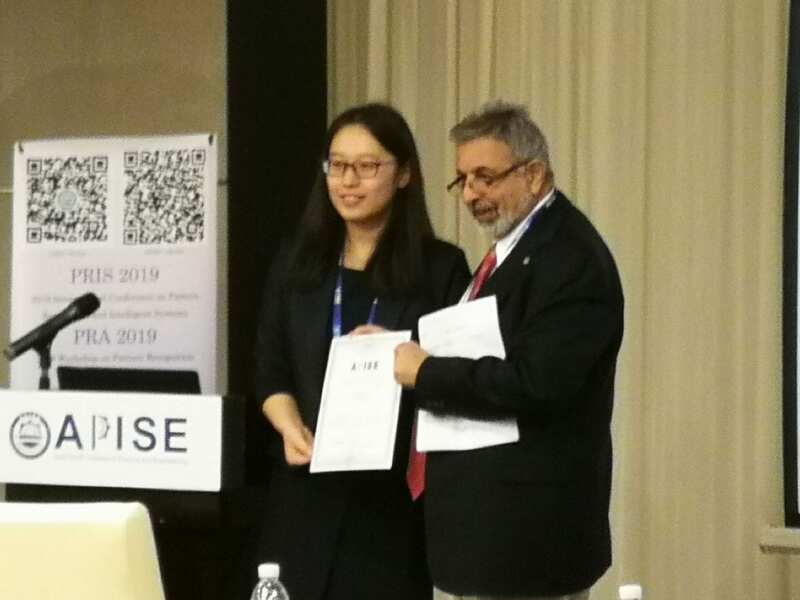 Luna was invited to give an oral presentation of her PhD research paper, titled “Feature Extraction Method of EEG based Biometrics”, and after giving an excellent presentation, was given the best presenter award. 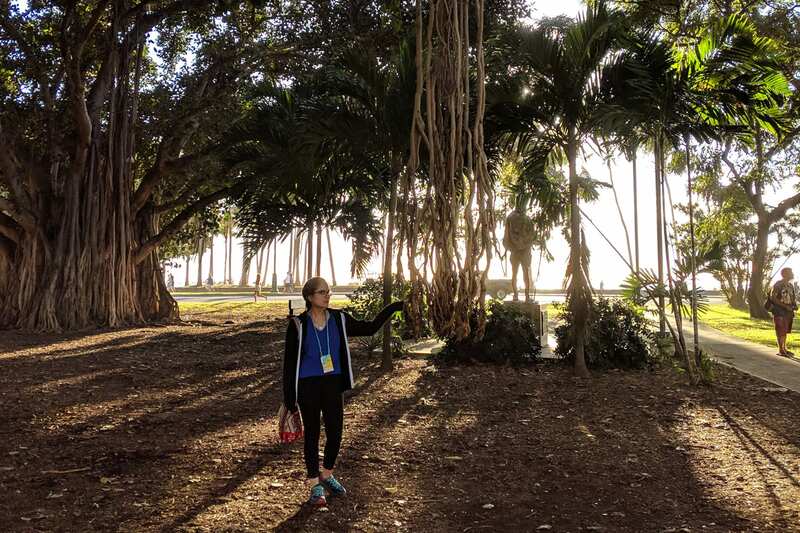 Luna attributes her achievement to good advice and plenty of practice: “I think the reason I received the award because my research advisor, Dr. Sung-Hyuk Cha, told me a PhD student should not only be good at writing a paper, but also should spend more time on presentation. One of his requirements for me is presenting my research paper with passion and appeal, and I practice as much as I can,” she said. Luna’s paper will go on to be published in the Conference Proceeding, which will be indexed by databases including Thomson Reuters, Inspec, El Compendex, and more. Sukun Li receives the award from Conference Chair, Prof. Majid Ahmadi, Associate Dean of the University of Windsor, Canada. 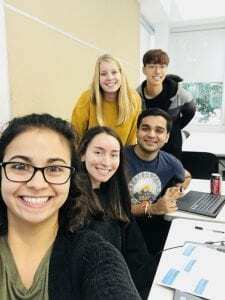 During the week of December 13th, 2018, several Seidenberg students and faculty traveled to San Francisco to attend the International Conference on Information Systems (ICIS). ICIS, the leading conference in the academic information systems field, is held annually in the middle of December at a new location. 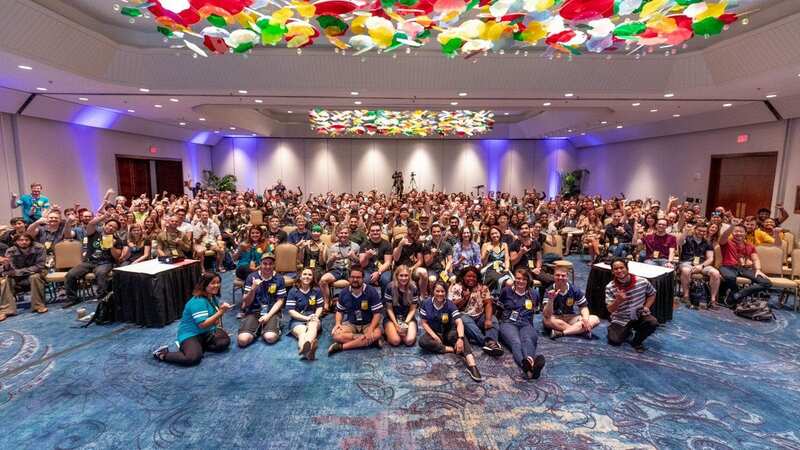 Seidenberg community members had the opportunity to travel to California for last year’s prestigious conference. Attendees of the conference—Dr. Daniel Farkas, Dr. Namchul Shin, Dr. Li-Chou Chen, student Tianyu Wang, Dr. Yegin Genc, and Dr. Isaac Vaghefi—hosted workshops, presented talks, and papers, and won some pretty amazing awards. Dr. Farkas and Dr. Shin hosted a GIS workshop during the conference. The half-day workshop on Location Analytics and Location of Things brought in scholars from around the world interested in this area to discuss their professional experiences and research. 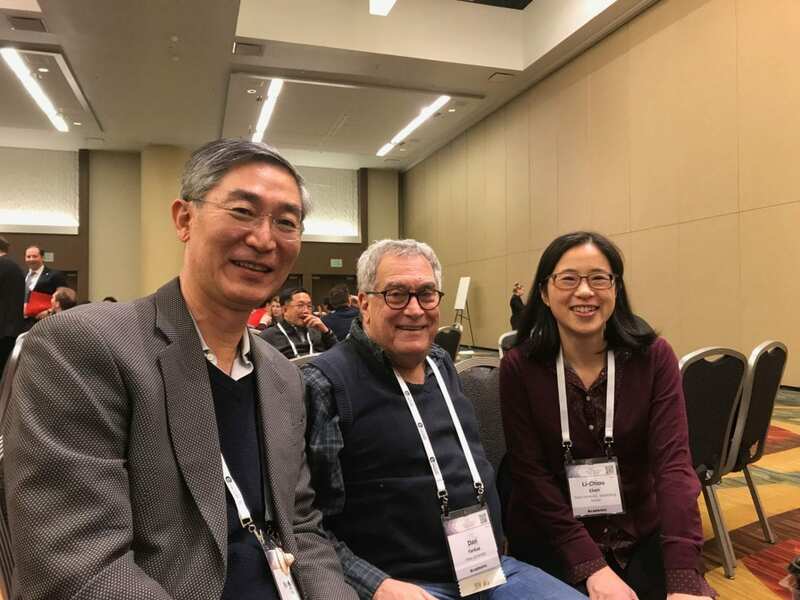 Left to right: Dr. Namchul Shin, Dr. Dan Farkas and a colleague from University of Redlands, CA, who is one of the co-organizers of the workshop held at ICIS. Dr. Farkas also worked with Dr. Chen to present a TREO talk on the topic of “Individual Attitude, Trust, and Risk Perception towards Blockchain Technology, Virtual Currency Exchange, Cryptocurrency Transactions and Smart Contracts.” This talk opened up dialogue about each of these subjects at the conference. Tianyu, who is in the process of obtaining a Ph.D., presented a paper, co-authored with Dr. Chen and Dr. Genc, titled “An N-gram-based Approach for Detecting Social Media Spambots.” Tianyu won the Doctoral Research Award from the PRE-ICIS SIGDSA symposium for the paper. Lastly, and most impressively, Dr. Vaghefi won an award for the highly competitive “Paper-A-Thon,” in which he competed against 15 international teams. 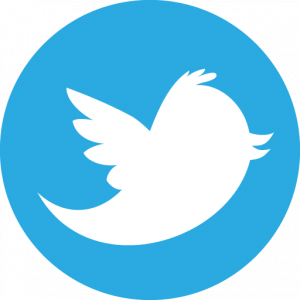 The paper submitted by Dr. Vaghefi, “DIGITAL DETOX? Understanding Users’ Abstinence from Social Network Sites Use,” was selected as the best paper to be presented at the conference. 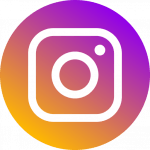 Overall, the paper “embeds a series of mixed-method studies to understand how social network users can take a break from technology and its positive outcomes,” according to Dr. Vaghefi. 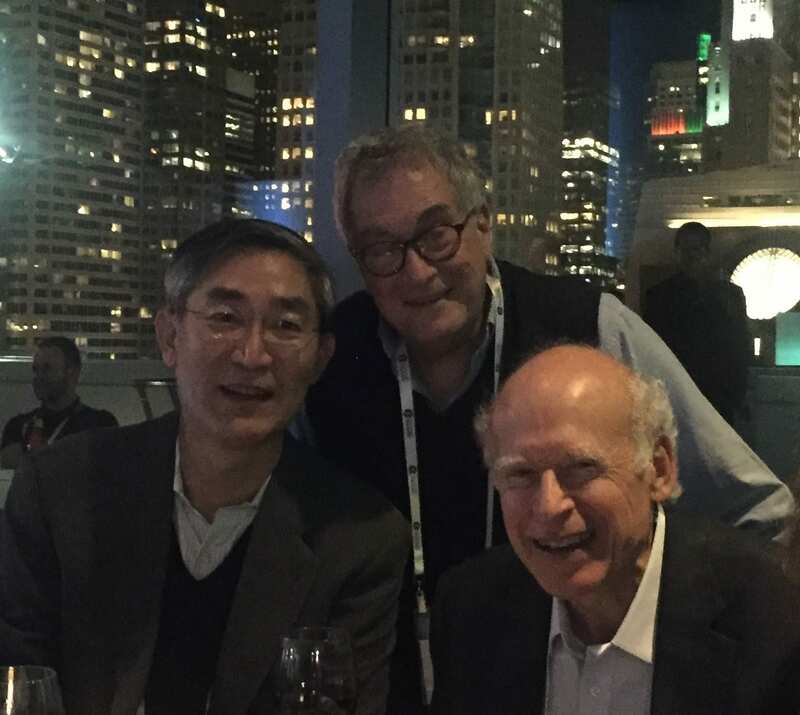 With Tianyu’s Doctoral Research Award and Dr. Vaghefi’s winning “DIGITAL DETOX?” paper, Seidenberg had some major wins at the ICIS. The Seidenberg community continues to create leaders in the information systems field. If you’re interested in attending the ICIS this coming December, get in touch with one of the previously mentioned faculty members and get started on your ideas! 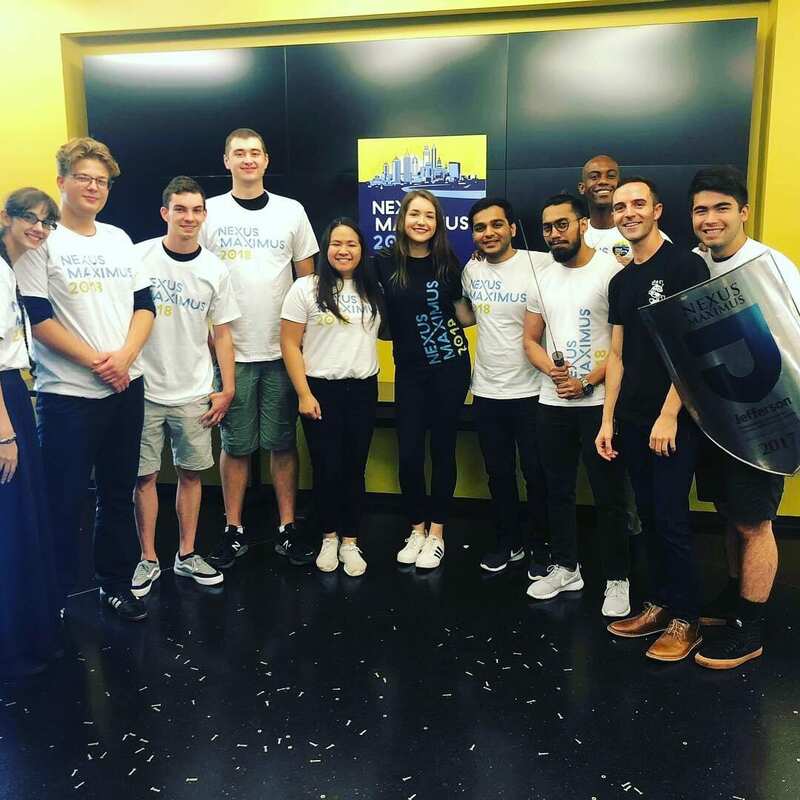 In September 2018, students from Pace University’s Seidenberg School of Computer Science and Information Systems presented innovative solutions to problems at Nexus Maximus. In order to showcase their hard work properly, we reached out to some of the students who attended the conference in order to hear about their experiences first-hand. Technology students who attended the conference—Chinmay Joshi, Ronak Pansara, Ezana Ceman, Joseph Goggin, Kyle Hanson, Naglis Bukauskas, William Bender, Christopher Cherestal, and Laina Posner—two students got in touch with us to discuss their experiences. They outlined what they experienced and highlighted the best portions of the weekend-long experience. Some of the concepts worked on included strategies to battle food insecurity, homelessness, and much more. While the projects themselves shined a light on the groups’ innovative minds, Ezana explains that recognition wasn’t the highlight. 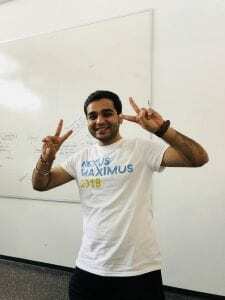 Nexus Maximus assists students by giving them the opportunity to learn how to develop and present projects, but the inspiration comes from the students themselves. The willingness to create innovative solutions to communities problems showcases the determination that these students have to create a better world. Ronak Pansara, a graduate student who will complete his master’s degree in Information Systems in May 2019, also spoke about his experience at Nexus Maximus and the project that his team presented. “Though we didn’t win any awards, we did get one [non-governmental organization] (NGO) [which] supported our cause for homeless people,” Ronak states. The recognition in itself was a win for the team. Another team, which included Chinmay Joshi and others, did get recognized with the “Maxime Innovation” award from the conference for maximum innovation. 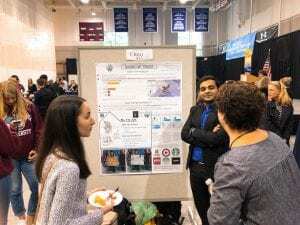 The team worked on a project, titled “Fresh Express”, that tackled how to better deal with food insecurity and waste within the Philadelphia area. Overall, all of the students experienced growth and success at Nexus Maximus. 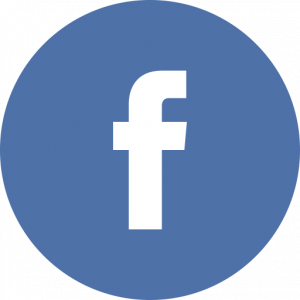 Both Ronak and Ezana recommend this opportunity to other students. If you’re interested in attending in September 2019, grab some classmates and get to work on the next innovative idea! 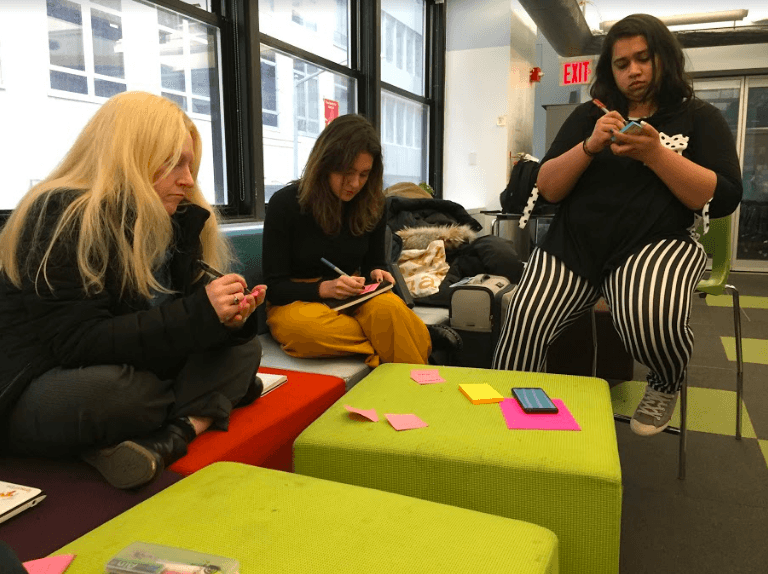 On November 30, 2018, the Seidenberg School of Computer Science and Information Systems held a daylong Social IoT Workshop on the New York City campus. The workshop, which came with the slogan “innovation development in four hours,” held a contest in which participants worked to develop a fully thought-out product to pitch in just four hours. The focus was on fixing problems with socially innovative approaches. Students were placed into groups. There were a total of five teams for the workshop. Groups were tasked with coming up with the stigmas and problems associated with five different categories: zero hunger, well-being and security, energy and well-being, mental health, and quality education. While the design thinking process usually involves five steps: empathize, define, ideate, prototype, and test, time and budget dictated that this session only used the steps from define to prototype. Each session during the four-hour workshop lasted from 45-60 minutes. The first session started off with introductions, so each group got to get to know one another first. As a Design Factory event, participants in the workshop hailed from all around the world: alongside our own NYC Design Factory students, we had the company of many participants from Design Factory Korea (DFK), Aalto Design Factory in Finland, DF Javeriana Bogota in Columbia, and Fusion Point in Barcelona. With so many cultures and communication styles together, one thing became clear: working together would be key! Once the first session ended, groups presented their finalized idea to a panel of judges. Upon reviewing their ideas with the panels and receiving constructive criticism and praise, the groups had the opportunity to update their designs and plans in the next session. The last sessions included making presentation plans and prototypes. Each group made either crafted or sketched out prototypes, presentations, and idea explanations for the panelists. Once their pitches and prototypes were finalized, the groups were ready to present to everyone! The five groups presented radically innovative ideas for each social problem they were assigned. Among these ideas was Ami, a “lifelong smart companion that analyzes and interacts with its user as an emotional support friend.” Another included a heated blanket that monitors body temperature. After each presentation finished, the judges grouped together to determine the winners. The panelists decided on two winners this workshop, instead of just one. Team “Guardians of Data,” who worked on creating an anonymous platform for patients and physicians, and the team that worked on a malnutrition detection machine were declared the overall winners. Congrats, teams! 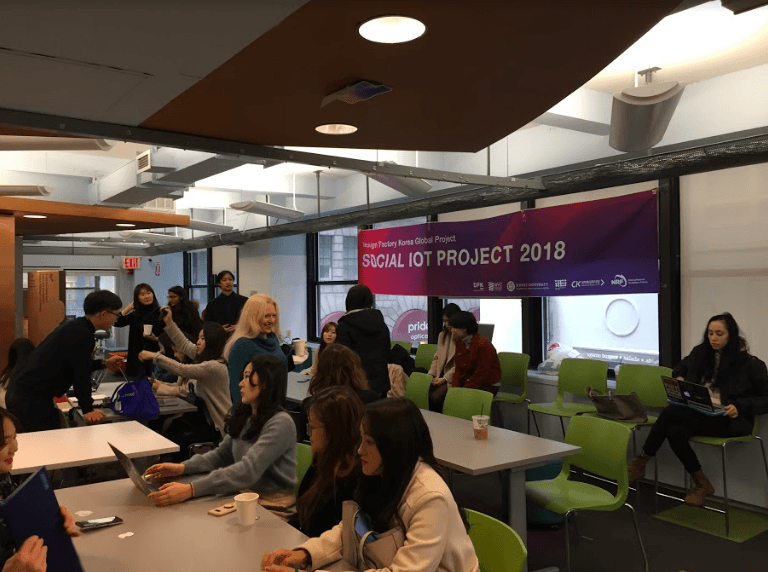 Student Zachary Demeglio, a freshman Information Technology major on the Pleasantville campus, also explained what he enjoyed about the Social IoT workshop. 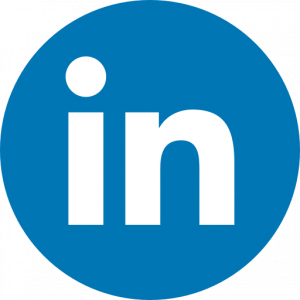 We can’t wait to host the Social IoT workshop next year, either! 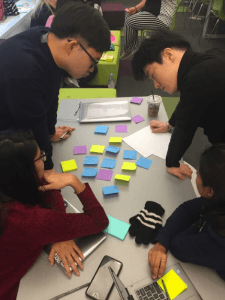 Our huge thanks go to Design Factory Korea for working with us to make it happen, and for those of you interested in taking part in this unique experience in Fall 2019. 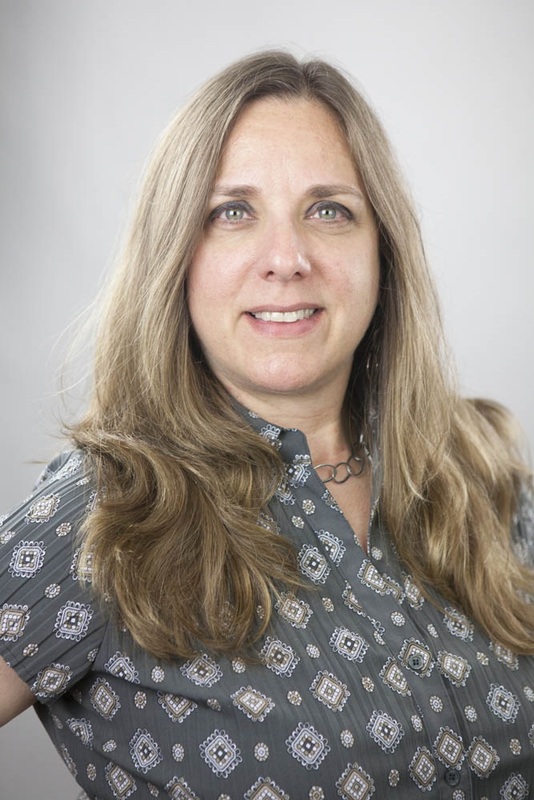 PhD student Sandra Kopecky will be presenting her paper “Cyber Security Paradox from a User’s View Point” at Computing Conference in London this summer. The conference, sponsored by IEEE, will see Sandra presenting her work to an international audience of peers. 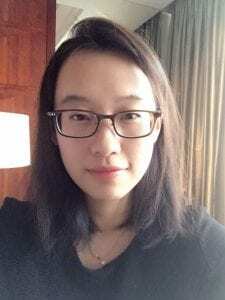 The publication of the paper will fulfil one of the dissertation requirements and put Sandra one step closer to earning her Doctor of Philosophy in Computer Science. Given that Sandra was the sole author of the paper, having it accepted for publication and presentation at the conference is a big deal. “I’ve been on various panels discussing cyber security, women in the engineering/computer field, my view point as a college student – at various levels, and my background. But never to present my work,” Sandra said. So why did Sandra choose a unique topic like cybersecurity from a user’s point of view? Sounds like a great paper – the idea of ‘user first’ is no stranger to user experience and human-computer interaction, and it’s certainly interesting to hear about one of our students considering the user’s viewpoint when it comes to cybersecurity, too. Enjoy the conference, Sandra, and we can’t wait to hear about it when you get back!